Get ready to experience Australia like never before. 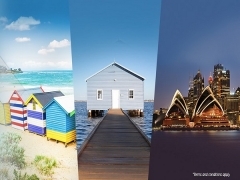 Get our special price to explore Sydney, Melbourne or Perth with The World’s Best Cabin Crew. Valid for flights departing from Singapore only. Valid on GA flight with GA aircraft, discounted fare is not valid for codeshare flight. All special fares are subject to seat availability. For more information, please contact Garuda Indonesia Singapore Office +65 6250 2888. Check out Garuda Indonesia for more details about this offer and to book your seats now!